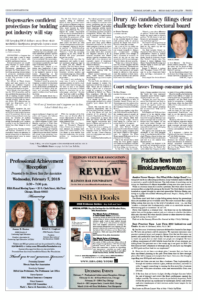 The Chicago Daily Law Bulletin published this piece in print on Thursday, Jan. 11, 2018. SPRINGFIELD — Congress has little more than a week to renew legal protection for states with medical marijuana programs. Federal lawmakers are considering whether to renew legislation, called the Rohrabacher- Blumenauer Amendment, that prevents the Department of Justice from spending federal dollars to prosecute marijuana-related charges in states where cannabis is legal. The provision is set to expire Jan. 19. But officials at Illinois dispensaries and legal experts in the industry are confident Congress will act and that the state’s marijuana business will continue to grow. Scott Abbott, chief operating officer for HCI Alternatives, said he does not think the amendment is at risk of expiring because medical marijuana programs have received “enough traction” with the American public. HCI Alternatives operates two dispensaries, one in Collinsville and the other in Springfield. Just last week, Attorney General Jeff Sessions announced he was rescinding Obama-era guidance to federal prosecutors to deprioritize marijuana-related cases in states with legal programs. “Given the [d]epartment’s well-established general principles, previous nationwide guidance specific to marijuana enforcement is unnecessary and is rescinded, effective immediately,” the memo states. His announcement came days after recreational cannabis became legal under California state law. Sessions has a history of criticizing state legalization of marijuana. Last May, he wrote a letter to the legislative leaders in both houses disapproving of the Rohrabacher-Blumenauer Amendment and asking that Congress not renew the legislation. “I believe it would be unwise for Congress to restrict the discretion of the [d]epartment to fund particular prosecutions, particularly in the midst of an historic drug epidemic and potentially long-term uptick in violent crime,” he wrote in the letter. In both his memo issued Jan. 4 and his letter to Congress, Sessions argues marijuana is dangerous and points out Congress also believes marijuana to be dangerous. The 9th U.S. Circuit Court of Appeals, sitting in California, looked at what protections states with medical marijuana programs are afforded under the amendment twice, most recently in United States v. Steve McIntosh. The court argued the Justice Department could not use its allocated funds to prosecute individuals who operated within the parameters of California’s medical marijuana laws. The court made clear that the amendment only applies to medical marijuana programs, legal in 29 states and the District of Columbia. The Cole Memo, issued in 2013 by former deputy attorney general James Cole, did not differentiate between medical and recreational programs. States with the latter risk potential federal prosecution. While the rescission of the Cole Memo may not directly affect licensed dispensaries in Illinois, it could indirectly perpetuate an existing industry issue. The federal government considers handling money associated with a marijuana transaction to be money laundering, and the memo issued “benchmarks” that clarified which suspicious activity reports banks should file each time money in a marijuana business’ account is manipulated, William Silas Hackney III, a partner in SmithAmundsen’s financial services group, said. 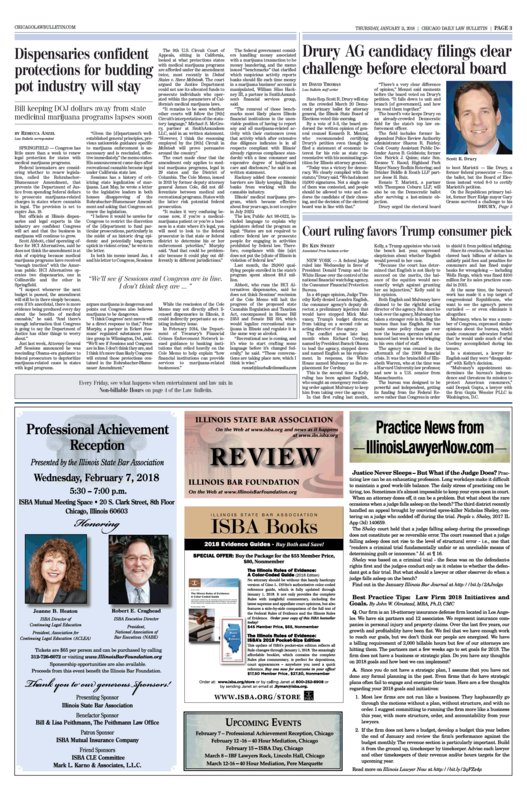 “The removal of those benchmarks most likely places Illinois financial institutions in the unenviable position of having to report any and all marijuana-related activity with their customers (even that activity which after extensive due diligence indicates is in all respects compliant with Illinois’ already rigorous compliance standards) with a time consumer and expensive degree of heightened care and disclosure,” he said in an written statement. Hackney added these economic barriers are likely keeping Illinois banks from working with the cannabis industry. Illinois’ medical marijuana program, which became effective about four years ago, is set to expire in July 2020. Last month, the 29,900 qualifying people enrolled in the state’s program spent almost $9.3 million. Abbott, who runs the HCI Alternatives dispensaries, said he does not think Sessions’ rescission of the Cole Memo will halt the progress of the proposed state Cannabis Regulation and Taxation Act, encompassed in House Bill 2353 and Senate Bill 316, which would legalize recreational marijuana in Illinois and regulate it in the same way as alcohol.